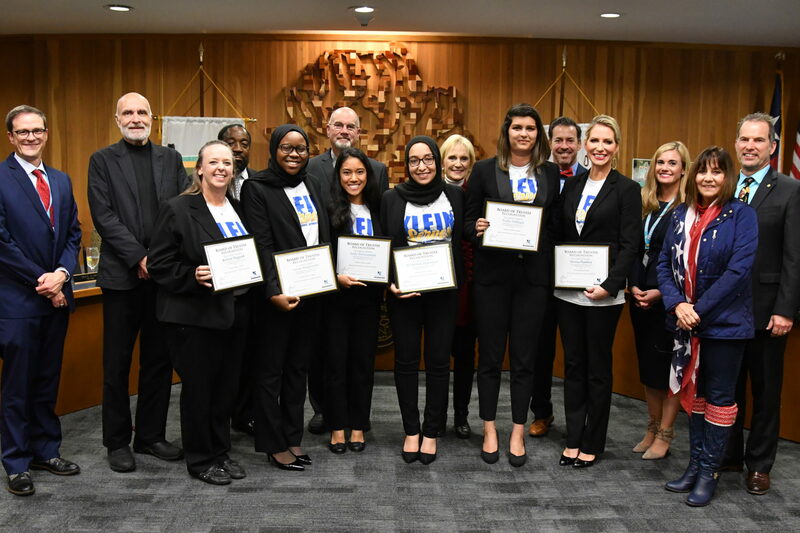 Klein High School Student leaders were presented with the first-ever Profile of a Learner recognition during the November Board of Trustees meeting. The award for recognized the students for exemplifying what values-driven leadership looks like through KleinServes. Andy DeGuzman, El-Shymaa Mohamed, Nadia Siddiqui, and Ayisat Adegbindin, with the support of Health Sciences teacher Kristen Haggard and Klein High School principal Jessica Haddox, mobilized over 850 Klein High School students from Klein High School to volunteer at 20 locations across the area for the KeinServes service event. The group was presented with the first-ever Profile of a Leader recognition for being Promise2Purpose investors who are deeply committed to students. Following the award presentations, DeGuzman, Mohamed, Siddiqi, and Adegbindin presented an in-depth overview of the day, which connects directly with Klein High School’s “Klein5” core values of empathy, gratitude, perseverance, integrity, and service. Their presentation was part of a report to the Board on Profile of a Learner in Action, Building Community. In the report, they shared some interesting statistics from the day of service. 68% of the students volunteering were first-time volunteers. 99.7% of the students said they would volunteer again.